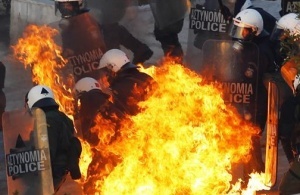 (Reuters) – The Greek parliament approved a deeply unpopular austerity bill to secure a second EU/IMF bailout and avoid national bankruptcy, as buildings burned across central Athens and violence spread around the country. Cinemas, cafes, shops and banks were set ablaze in central Athens as black- masked protesters fought riot police outside parliament. State television reported the violence spread to the tourist islands of Corfu and Crete, the northern city of Thessaloniki and towns in central Greece. Shops were looted in the capital where police said 34 buildings were ablaze. Prime Minister Lucas Papademos denounced the worst breakdown of order since 2008 when violence gripped Greece for weeks after police shot a 15-year-old schoolboy. “Vandalism, violence and destruction have no place in a democratic country and won’t be tolerated,” he told parliament as it prepared to vote on the new 130 billion euro bailout to save Greece from a chaotic bankruptcy.